Explore one of the fascinating and historic Cities of the Dead with this 2-hour tour of St. Louis Cemetery No. 1 in New Orleans. 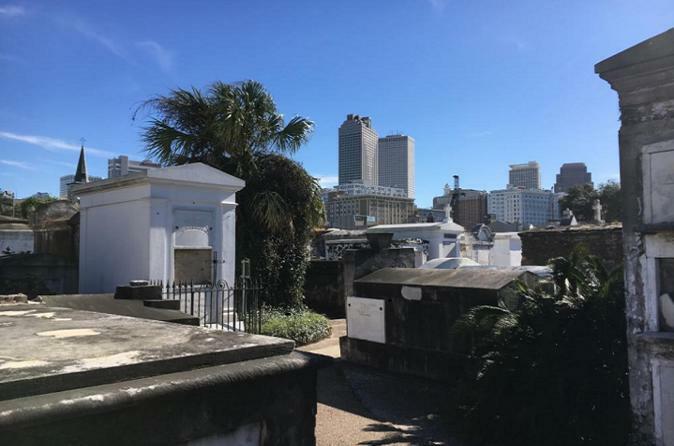 Meet your guide in the French Quarter and head for St. Louis Cemetery No. 1. Learn about tomb architecture and burial procedures, and visit the tomb of New Orleans' most infamous Voodoo Queen, Marie Laveau. This historical tour of the cemetery takes you back in time and recounts the days when wealth was measured by how expensive one's tomb was. The 2-hour walking tour is offered daily at 10:00 AM and also Monday-Saturday at 1:15 PM (the cemetery is closed at noon on Sunday, so there's no afternoon Sunday tour) and departs from Rev. Zombie's Voodoo Shop, 723 St. Peter Street, between Bourbon & Royal Streets across from Preservation Hall.